Live at the Gessnerhalle, Jazznojazz Festival, Zurich, Switzerland, October 28, 2001. Max Roach died on August 16, 2007. He was 83 and left behind a great jazz legacy. Mark Corroto, in allaboutjazz.com, said Max Roach was "a drumming institution." 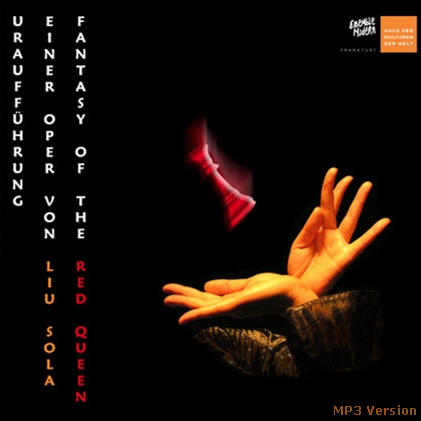 Late in his career, Roach teamed up with pianist Jang Jon and erhu player Chen Jiebing to form the Beijing Trio. Reviewing the trio's self-titled 1999 album, Corroto wrote: "The recording, a combination of duos and trios of Roachs drums, Jang's piano and Chen's erhu, a Chinese two-string violin, is an intimate portrait of well, let's call it blues. Jang has made his career at the piano fusing Chinese sounds with jazz. His overtly political music has been well documented on Soul Note and Asian Improv Record labels... This isnt a gimmicky recording in the least. Its at times a drum clinic, other times meditative music, and mostly great interplay between improvisers. To paraphrase Duke Ellington there is no such thing as world music (jazz), just good music and bad music. Look for this disc on many, including my top ten releases for 1999." Pianist Jang Jon recalls on his website (www.jonjang.com/news/maxroach.html): "After Max, Chen Jiebing and I recorded Beijing Trio the summer of 1998, we began our tour one year later. 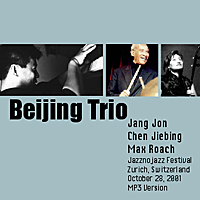 Three years later when Max was 77 years old, the Beijing Trio toured Europe in 2001. Max went to bat for Jiebing and me. One cannot imagine the amount of skepticism that exists when the world-renowned Max Roach performs with two Chinese artists. First, we were housed in separate hotels. Second, before Max was to receive a medal of honor from one of the universities in Milano, Italy and give a lecture-demonstration, he requested that Jiebing and I join him onstage. The main organizer, who was a prominent professor at the university, asked, "Do they speak English?" After Max gave his comments about the music, he introduced me and I offered my perspectives on the future of music in the United States in the 21st Century." For the 2001 Zurich show, great interplay are the operative words. With such cross-cultural music, the tension is in making a statement about one's so-called cultural roots balanced with the need to blend in together so as not to create a mess. Chen Jiebing's erhu has a very distinctive (Chinese) sound and it is to Max Roach's credit that he manages to find the space to support the others or to define as his own. Chen's playing is quite traditional - she is definitely no John Zorn of the erhu. Pianist Jang Jon is more improvisational. There are many instances where he starts off conventionally "Chinese" and then veers off into something else or vice versa. It is then left to Roach to give the music that "jazzy" feel - it is his drumming that provides the backbone and the glue that melds both east and west. Thanks to blackforest for sharing this excellent stereo FM recording on the internet. Moon Over The Great Wall into u.t. 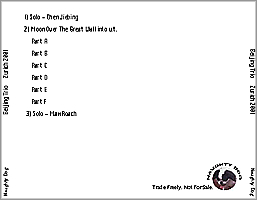 Click here to order a copy of Beijing Trio.